George Whiteman with the Top Club trophy and Top Girl winner Amy Paget. There was another dominant display by City of Peterborough Swimming Club (COPS) at the weekend. Hot on the heels of some excellent performances in the East Region Winter Championships and the National Arena League came another wonderful weekend of results at the City of Norwich November Short Course Meet. Lilly Davis won seven races. COPS produced stacks of podium finishes across the board to take the Top Club trophy and Amy Paget also received the Top Girl prize. Lilly Davis claimed a magnificent seven first places for the girls with Eliza Mardon touching first five times, while for the boys it was Joshua Martin leading the way with eight wins and Matt Newson and Matthew Wouldham both collecting six. 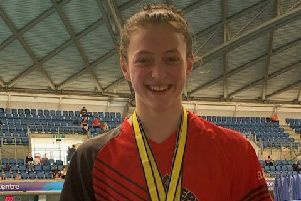 COPS head coach Ben Negus said: “Norwich was a test event for our development and age-group swimmers and the goal was to get them race experience, develop their racing skills and get a few regional qualifying times on the board. “I was pleased with how the squad performed. They showed a real competitive commitment and a passion to win across all age groups and it was a joy to come away with the Top Club trophy. Charlotte Shaw and Isla Fullock-Holmes. “For many of the young ones this was a taste of their first really big meet and they rose admirably to the occasion and were not daunted by their competition at all. “Our nine year-olds really shone bright – particularly Lilly Davis, Olivia Mahoney, Salah Tajer and George Stevens. “So did the 11 year-old boys with Joshua Martin, Kieran Griffin and Safford Hewitt-White dominating their races with podium positions often flipping between the three of them. “However, a stand-out swimmer of the meet was neither a development or age-grouper, it was one of our youth squad swimmers - Matthew Wouldham. He had some outstandingly positive swims, winning a couple of events on the day and showing his strong improvement so far this year. 10 years: 1st Eliza Mardon 5:30:85; 2nd Isla Fullock-Holmes 5:37:22. 11years: 1st Ella Normington 5:34:76. 12 years: 1st Amy Paget 5:04:83; 2nd Jessica Mahoney 5:22:82; 3rd Jemima Tuffnell 5:28:54. 13 years: 1st Kiara Kovacs 4:54:88. 14 years: 2nd Sophie Galjaard 5:16:85. 9 years: 1st Lilly Davis 2:52.90. 10 years: 1st Eliza Mardon 2:35.68. 13 years: 1st Ella McGhie 2:14.60; 2nd Liv Lee 2:15.68; 3rd Kiara Kovacs 2:17.25. 12 years: 1st Anastassja Herdien 2:42:99; 2nd Jessica Mahoney 2:46:14; 3rd Amy Paget 2:46:56. 13 years: 1st Ella McGhie 2:22:65; 2nd Brenna Howell 2:31:05. 14 years: 2nd Sophie Galjaard 2:49:37. 9 years: 1st Lilly Davis 3:42.99. 10 years: 2nd Eliza Mardon 3:29.78. 12 years: 2nd Jessica Mahoney 3:04.83; 3rd Amy Paget 3:07.86. 13 years: 1st Liv Lee 2:44.57; 2nd Ella McGhie 2:49.44. 9 years: 1st Lilly Davis 3:19.86. 12 years: 3rd Amy Paget 2:44.33. 13 years: 1st Brenna Howell 2:32.96 ; 2nd Ella McGhie 2:33.03. 14 years: 1st Eve Wright 2:31.08. 9 years: 1st Olivia Mahoney 3:41:10. 10 years: 2nd Eliza Mardon 3:11:69; 3rd Isla Fullock-Holmes 3:20:88. 12 years: 1st Jess Shaw 2:41:48. 13 years: 1st Brenna Howell 2:40:08; 2nd Olivia Lee 2:43:51. 9 years: 1st Lilly Davis 1:39:24; 2nd Olivia Mahoney 1:43:74. 10 years: 3rd Charlotte Shaw 1:36:65. 13years: 3rd Ella McGhie 1:20:22. 9 years: 1st Olivia Mahoney 1:17.96; 2nd Lilly Davis 1:21.85; 3rd Tilda Clements 1:26.17. 10 years: 1st Eliza Mardon 1:12.78; 2nd Charlotte Shaw 1:13.66. 12 years: 3rd Jess Shaw 1:06.05. 13 years: 1st Kiara Kovacs 1:03.13; 2nd Brenna Howell 1:03.57. 9 years: 1st Olivia Mahoney 1:42:49. 10 years: 2nd Eliza Mardon 1:23:78; 3rd Charlotte Shaw 1:27:07. 12 years: 2nd Jess Shaw 1:12:89. 13 years: 1st Brenna Howell 1:10:30; 2nd Sophie Griffin 1:13:82; 3rd Olivia Lee 1:14:17. 14 years: 2nd Lauren Browne 1:12:74; 3rd Eve Wright 1:14:38. 9 years: 1st Olivia Mahoney 1:32:69; 2nd Lilly Davies 1:33:65. 10 years: 1st Eliza Mardon 1:22:45. 12 years: 3rd Jessica Mahoney 1:19:24. 13 years: 1st Olivia Lee 1:12:09; 2nd Brenna Howell 1:12:82; 3rd Sophie Griffin 1:12:96. 14 years: 1st Eve Wright 1:12:15; 2nd Lauren Browne 1:17:07. 9 years: 1st Lilly Davis 1:28.70; 2nd Olivia Mahoney 1:30.75; 3rd Tilda Clements 1:34.57. 10 years: 1st Eliza Mardon 1:20.48; 3rd Isla Fulluck-Holmes 1:23.13. 12 years: 2nd Jess Shaw 1:16.01. 13 years: 2nd Brenna Howell 1:10.85. 14 years: 1st Eve Wright 1:06.37 . 9 years: 2nd Tilda Clements 45:52. 10 years: 1st Charlotte Shaw 39.22. 12 years: 2nd Jess Shaw 34:72. 13 years: 2nd Kiara Kovacs 34.39. 10 years: 3rd Charlotte Shaw 46.43. 13 years: 2nd Liv Lee 37.09; 3rd Ella McGhie 37.87. 14 years: 2nd Eve Wright 37.95. 9 years: 1st Lilly Davis 37.71; 2nd Tilda Clements 40.13. 10 years: 1st Isla Fulluck-Holmes 33.74; 2nd Charlotte Shaw 34.73. 12 years: 1st Jess Shaw 30.30; 3rd Amy Paget 31.50. 13 years: 1st Ella McGhie 29.21; 2nd Kiara Kovacs 29.34 . 14 years: 1st Eve Wright 29.07. 9 years: 1st Lilly Davis 47.00 . 10 years: 3rd Charlotte Shaw 38.57. 12 years: 3rd Jess Shaw 32.74. 13 years: 1st Sophie Griffin 31.82. 11 years: 1st Safford Hewitt-White 5:45.19. 12 years: 1st George Whiteman 4:45.34. 13 years: 2nd Fabian Brudnicki 4:42.64. 14 years: 1st Matt Newson 4:39.87. 15 /over years: 1st Matty Cussell 4:40.27. 9 years: 3rd George Stevens 3:30:33. 11 years: 1st Joshua Martin 2:35:34; 2nd Kieran Griffin 2:44:67. 12 years: 2nd George Whiteman 2:22:08. 14 years: 2nd Matt Newson 2:15:80. 11 years: 2nd Joshua Martin 3:16.65. 12 years: 1st George Whiteman 2:40.95. 13 years: 1st Connor Walker 2:20.86 . 9years: 2nd Sala Tajer 3:55:49; 3rd George Stevens 4:15:20. 11 years: 1st Joshua Martin 3:13:19; 2nd Kieran Griffin 3:21:40; 3rd Safford Hewitt-White 3:26:94. 13 years: 1st James Rothwell 2:55:73. 15/over years: 1st Matthew Wouldham 2:35:65. 10 years: 3rd Mark Krolik 3:28:30. 11 years: 1st Joshua Martin 2:54:67; 2nd Safford Hewitt-White 3:01:19; 3rd Ismail Tajer 3:04:84. 12 years: 3rd George Whiteman 2:46:96. 14 years: 1st Matt Newson 2:33:43. 15/over years: 1st Matthew Wouldham 2:32:49. 11 years: 1st Keiran Griffin 3:01.24; 2nd Karson Lee 3:19.83 . 12 years: 3rd Joshua Spencer 2:46.29. 13 years: 1st Fabian Brudnicki 2:23.85; 3rd Connor Walker 2:31.00. 14 years: 1st Matt Newson 2:23.42. 9 years: 3rd George Stevens 1:39:49. 11years: 1st Joshua Martin 1:09:41; 2nd Safford Hewitt-White 1:14:47. 13 years: 3rd George Whiteman 1:06:37. 14 years: 1st Matt Newson 59.88. 9 years: 2nd Salah Tajer 1:39:12. 14years: 2nd Matt Newson 1:07:96. 15/over years: 3rd Matthew Wouldham 1:07:92. 10 years: 2nd Alex Harlow 1:36.14. 11 years: 2nd Joshua Martin 1:25.79. 12 years: 3rd George Whiteman 1:14.16. 15/over years: 1st Matthew Wouldham 1:05.42. 11 years: 1st Joshua Martin 1:27.97; 3rd Safford Hewitt-White 1:36.70. 13 years: 3rd Connor Walker 1:25.31. 14 years: 3rd Matt Newson 1:23.11 . 15/over years: 1st Matthew Wouldham 1:11.77. 9 years: 3rd Salah Tajer 1:45.14. 10 years: 2nd Alex Harlow 1:29.96. 11 years: 1st Joshua Martin 1:20.44; 3rd Safford Hewitt-White 1:24.11 . 12 years: 3rd George Whiteman 1:19.29. 13 years: 2nd Connor Walker 1:11.33; 3rd James Rothwell 1:15.08 . 14 years: 1st Matt Newson 1:10.24 . 15/over years: 1st Matthew Wouldham 1:05.73 . 11 years: 2nd Joshua Martin 41:78; 3rd Kieran Griffin 42.30. 15/over years: 2nd Matthew Wouldham 33.99. 9 years: 3rd Salah Tajer 47.09. 11 years: 1st Safford Hewitt-White 36.90; 2nd Joshua Martin 37.83. 13 years: 1st Fabian Brudnicki 32.43; 3rd Connor Walker 33.29. 14 years: 2nd Matt Newson 32.22. 11 years: 1st Joshua Martin 31.30; 2nd Safford Hewitt-White 33.15. 13 years: 2nd Connor Walker 28.39. 14 years: 2nd Matt Newson 27.61. 15 over/years: 3rd Matthew Wouldham 26.81. 11 years: 1st Joshua Martin 36.44. 14 years: 1st Matt Newson 31.35. 15/over years: 1st Matthew Wouldham 29.10.